Fourteen people suffered minor injuries Thursday during clashes in Madrid between police and striking taxi drivers, emergency services said. The drivers are calling for tighter regulations for ride-hailing services. 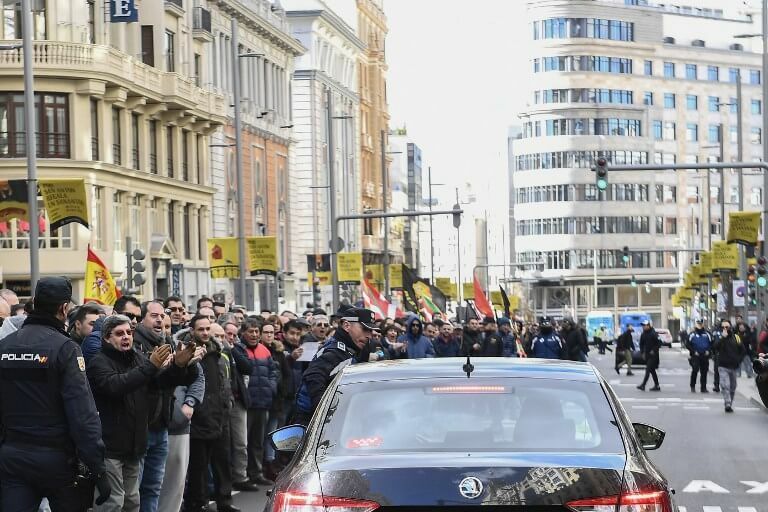 The injured included three police officers and a journalist covering the protests, an emergency services spokesman added. Police said they had arrested two people at protests at two separate locations. 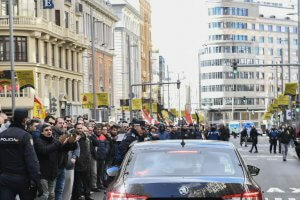 Madrid taxi drivers began their open-ended strike on Monday, joining a strike started by their counterparts in Barcelona three days earlier. Spanish taxi drivers complain that rivals from ride-hailing apps like Uber work like taxis despite not being classed as such in law, competing unfairly since they do not face the same regulations and costs. But Barcelona’s taxi drivers ended their strike on Thursday at 6 am after the regional government unveiled regulations to restrict ride-hailing services like Uber, the Elite taxi union said on Twitter following a tight vote by its members in favour of the move. The new Catalan government regulations will oblige customers of Uber or its main Spanish rival, Cabify, to book services 15 minutes in advance. That means customers will have to wait at least that long before they can get a ride rather than having a vehicle arrive almost immediately. But after taxi drivers said the measure did not go far enough, the regional government said Tuesday that it would allow local authorities in Catalonia — if they deemed it necessary — to lengthen the pre-booking time to a maximum of one hour. Barcelona Mayor Ada Colau told reporters that a one-hour delay would be applied there. The new regulations also ban geo-localisation for ride-hailing services, which means users will no longer be able to find the car nearest to them on their app. On Wednesday, Uber threatened to withdraw from Barcelona if the new restrictions were implemented. ‘With these regulations apps like Uber of Cabify are literally being expelled from Barcelona, 63 companies will close and 3,000 people will be out of work,’ Jose Maria Goni, the president of Unauto, an association representing the ride-hailing services, told a news conference on Thursday.